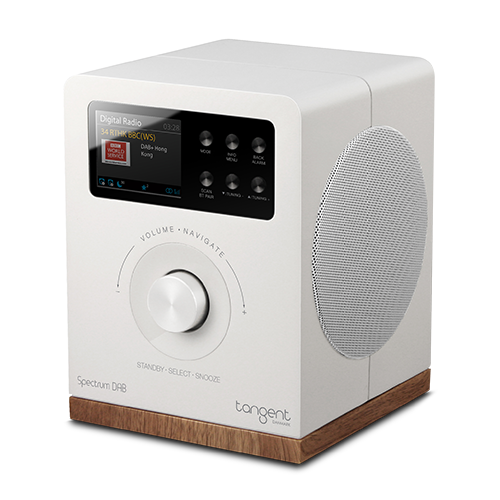 Tangent’s new Spectrum DAB offers high quality Danish audio engineering, a stylish Spectrum Series aesthetic design and Digital DAB radio functionality, all housed within one compact sized speaker system. The Tangent Spectrum DAB/FM allows fast access to thousands of stations with clear stereo sound quality whilst listening via FM, DAB and the new DAB+. If you want to listen to music, podcasts, audiobooks or other audio sources from your smartphone, tablet or computer, you can easily connect the Tangent Spectrum DAB to your device wirelessly via Bluetooth, or the AUX (mini-jack) jack on the rear panel using the cable supplied. The Tangent Spectrum DAB features specially developed side-firing, full-range speaker drive units on each side of the cabinet to produce a level of stereo sound quality that’s both crisp, detailed and precise… usually only found in larger and more expensive speakers. Thanks to additional EQ sound settings, you can also choose from 8 audio pre-sets, to ensure the type of sound always matches your music taste. Want to wake up to your favourite radio station in clear digital sound stereo? The Spectrum DAB features an integrated alarm clock function that can be set to your favourite radio station and programme. The Tangent Spectrum DAB is a high quality, stereo Digital radio with compact dimensions for when space is limited. Our designers have continued the clean and minimalist Scandinavian design of the award-winning Spectrum loudspeaker series, using the attractive and durable black or white matt finishes with the elegant walnut veneer, wooden base plinth. The Spectrum DAB is also designed with ergonomic and functionality benefits in mind, from the easy to navigate central multifunction button to the high-res. colour LED display and touch button controls.